Home Blog Oil Rig Accident Oil Rig Accident: Who is at Fault? How can you tell who’s at fault in an oil rig accident? Determining who’s at fault goes a long way toward getting people they compensation they deserve. If you’ve been in an oil rig accident, you’ll definitely want to know who was responsible, since you may be entitled to compensation. However, these accidents can be complicated, with a lot of different factors to consider. How can you tell who’s at fault? In this guide, we’ll break it down – keep reading to learn what you need to know about oil rig accidents. Oil rigs are one of the most dangerous locations to work. These jobs are right up there with being a stuntperson, firefighter, roofer, or miner. What about oil rigs makes them so dangerous? They tend to work far away from shore, making things risky even for minor mishaps, since workers are a long way from modern medical care. Most oil rigs can only be accessed by sea or air, so it takes a long time to get medical attention. If an accident does happen, workers need to be transported by helicopter to the nearest hospital. This can turn relatively small injuries into major issues. Of course, the actual incidents that happen on an oil rig are also more likely to cause injury than what happens at other jobs. Oil is very flammable, and fires and explosions are common on these rigs. Other accidents involve transportation: workers can get injured during the flights to and from the rig, or while moving around on the rig itself. Special equipment and heavy objects on an oil rig also make accidents more likely. The weather conditions of these off-shore locations only add to the risk factor. Extreme weather can cause a rig to collapse and even sink. An oil leak following a weather event makes walkways slippery, leading to another cause of injury. And, of course, the oil itself is a toxic substance, in addition to being slippery and flammable. Combine that with the heavy machinery involved, and one could say an oil rig is a recipe for disaster. That’s why so many workers find themselves in an oil rig accident – often with no idea of who could be at fault. Now, let’s take a look at the most common kinds of injuries these accidents can lead to. Minor injuries often occur due to slips and falls. However, other, more serious injuries are a greater cause for concern. Burns can happen in one of two ways. First, workers can sustain chemical burns by touching or otherwise coming into contact with toxic chemicals that are often on drilling platforms. Second, explosions and fires often cause burns in oil rig workers. All it takes is a single spark to set off the flammable gas and oil on the ship. If an employee is nearby at the time, burns and scars will result. 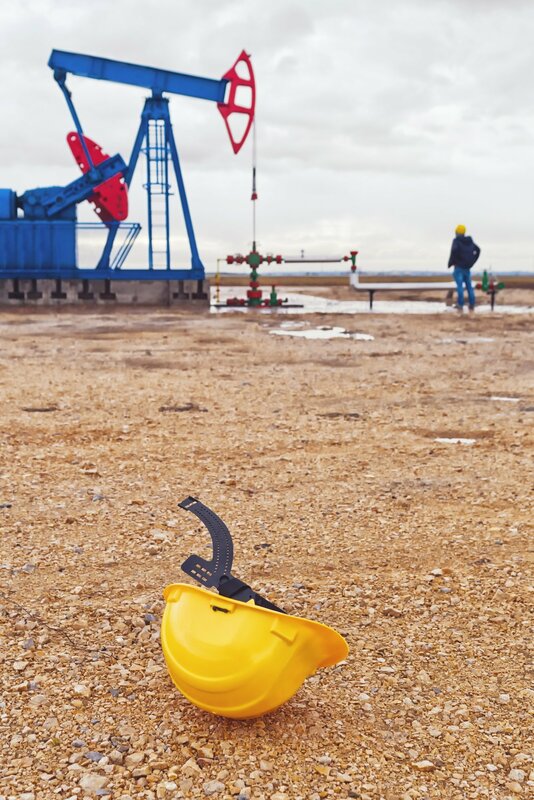 Another common type of oil rig accident is a brain or head injury. Many oil rig employees have to work from significant heights, and can sometimes lose their footing – especially if a surface is slippery with oil. When they land, their head, brain, or spinal cord can easily get damaged. Another risk factor comes from tools that fall down from workers high above. A worker lower on the platform can easily get hit in the head by a tool dropped from higher up. Of course, a simple slip and fall from a normal height can also result in a head injury at times. Working on an oil rig often means being subjected to toxic fumes. These fumes can be poisonous, even lethal in some doses. Sometimes, the effects happen in the short term. Often, though, the effects of fume inhalation take a long time to manifest. Lung and respiratory issues, brain damage, and many other health issues are caused by fume inhalation. Heavy equipment and machinery are often used on an oil rig. If it’s operated unsafely or incorrectly, a worker can get injured so seriously that an amputation is necessary. Limbs can be crushed or injured. Since hospitals are so far away, a limb that could have been saved sometimes gets lost during the time it takes to get for a worker to get to the hospital. The work environment on an oil rig is already unsafe. However, there are other things that can make an accident even more likely to occur. Examining these potential causes goes a long way toward figuring out who may actually be at fault. Human error or carelessness often causes accidents. Many times, the employer is responsible at the end of the day. For example, a lack of proper communication or training for employees can result in accidents that could easily have been prevented. If safety procedures haven’t been put in place, or if those procedures are outdated, the employer may also be at fault. The same goes for cases when equipment hasn’t been properly maintained or repaired. Delays in repairs can lead to injury and even death for workers. Improperly stored chemicals increase risk factors further. Gas leaks can occur when equipment isn’t maintained, and cables can break when they aren’t regularly replaced. Of course, fellow workers on the rig can also be at fault. Recklessness and carelessness quickly lead to an accident in such a dangerous work environment. However, employers are contractually required to give their staff a safe environment to their workers. For example, they have to create and implement safety procedures, and provide training, as well as providing many other safety precautions. If they fail to hold up their end of the deal, the accident that results is the employer’s fault. Do You Know What to Do After an Oil Rig Accident? If you were in an oil rig accident, you might qualify for compensation from your employer. You’ll need great legal representation on your side to help you through the process. To get started, contact me today.